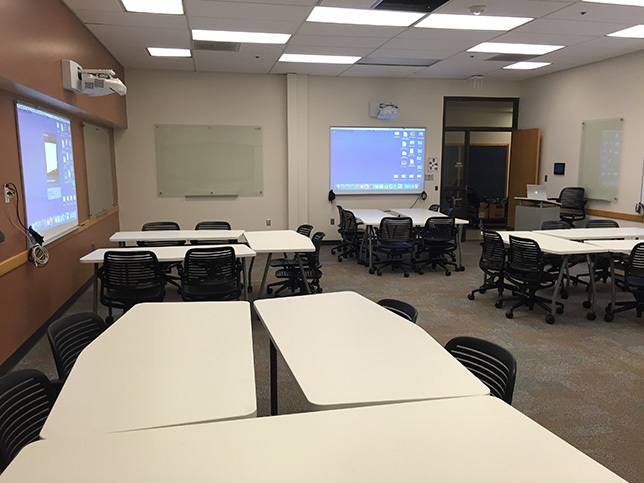 Salt Lake Community College's flex classrooms feature mobile furniture for pod work, wall-mounted interactive technology for each student group and a control panel for instructors to send content from themselves or any group to the entire room. The business of audiovisual has come a long way, baby. What used to be a department in charge of the film collection and movie projectors has now morphed into an organization that addresses collaboration needs, streaming media, assistive hearing and a whole lot more. In fact, as the use of technology in colleges and universities has grown, much of its implementation, especially for classrooms, has fallen on the shoulders of the AV crew. Here are five trends driving AV in higher ed today. "The big push right now is AV over IP," declared Mike Tomei, an independent AV design consultant who serves higher ed clients and is a frequent contributor to Campus Technology. While AV used to be a point-to-point system that relied on "expensive matrix switchers" to connect equipment, now schools are moving to systems that use streaming encoders and decoders that can operate through standard gigabit-caliber network switches. Penn State is studying this trend closely, noted Dave Test, group leader of classroom technology. "Having that flexibility of running all of your AV stuff over commodity network hardware and cable runs — that's something we're going to be evaluating as we develop new spaces and certainly as we take part in new building designs. Instead of investing so much money in a proprietary switching system, [we want to] embrace that commodity network ethos. That's pretty appealing." The idea of AV over IP wasn't always popular, particularly among networking professionals. Two or three years ago, said Chris McIntyre-Brown, associate director of professional equipment at Futuresource Consulting, "If you spoke to an IT manager about hanging AV off the network, they'd run a country mile: There's lack of control, I don't know how secure it is, etc." That has changed "almost quantitatively" now, he said. "There's an acceptance that it makes more practical sense to manage all of your assets — be they AV or IT — on a single network. There's an education that's happening in IT to understand that AV is no longer a dark art. Those barriers are coming down." Institutions that haven't begun making that transition yet can still plan by putting in the infrastructure that can handle the extra traffic, Tomei suggested, whether by building up the standard campus network to support high-definition streaming or by creating a separate network upon which the AV devices run. This campuswide trend comes to the forefront in AV because wireless AV devices enable more facile collaboration in the classroom. A couple of aspects come into play. First, there are the control elements, such as figuring out how to enable instructors and students to share what they're looking at on their personal devices on larger classroom displays. After testing about 35 products, Penn State has begun deploying Mersive Solstice, a wireless mirroring and collaboration platform. The university also runs Doceri Desktop, which allows instructors to operate their desktop or laptop from a tablet anywhere in the room, including making annotations on a presentation. "It frees up the instructor from being stuck at the podium or the board lecturing," Test said. "They can be anywhere there is WiFi, and we have WiFi in all of our classrooms." When the additions to a presentation are complete, the program allows them to capture images of the changed content to share with students. Also, there's the setup of the room to take into consideration. If you can't get behind the walls or ceiling, wireless is the way to go, said Kurt Shirkey, assistant director of classroom tech support at Salt Lake Community College (UT). The college faced just such problems while setting up a new set of "flex classrooms." "If you didn't want cable and wires hanging all over the outside of the room, one solution was to get rid of them and go wireless," he noted. Those spaces each sport multiple wall-mounted Epson BrightLink wireless projectors. "There's not a matrix switcher in the room. It's just a wireless connection to the BrightLinks through a free app you can download," he said. "You walk in there with a laptop or mobile device and connect into any projector in the room." And yes, Shirkey acknowledged, wireless requires "a little more work from the instructors and students because they have to download the app and connect in by typing in the IP address of the technology." But it's worked out "pretty well," he added. The push to connect to, share with and work alongside others, whether in the classroom, across campus or across the world, brings AV collaboration front and center. "There are so many different universities that are sharing content with each other these days," said Tomei. "You might have a class that's co-taught by multiple professors at multiple schools." So it's no mystery to him that the "No. 2 most requested feature" he runs into at client sites (behind AV over IP) is web conferencing capabilities. Previously, schools were likely to invest heavily in videoconferencing technology, "where they had to pay for $20,000 videoconferencing codecs," he said. Now the solution is mostly software-based, considerably cheaper and plentiful, with offerings such as Zoom, Skype Meetings, BlueJeans and Cisco WebEx, among others. "With those services these clients can get real high-quality web conferencing that they were previously doing at 10 times the cost with the videoconferencing hardware." Similarly, in the past when a college had to use an overflow room to accommodate extra people for an event, getting video and audio from one room to the other "was a little bit of a Herculean task," said Penn State's Test. "Now you can buy a thoroughly inexpensive box that will capture all of that as a stream, and then you can send it to the other room via the web or another device." Test said that being able to move content so much more freely and at such a lower cost will have a "huge impact" on classroom design and co-teaching. "Penn State has 24 campuses, and we're increasingly offering classes where half the students are on one campus and half are on another campus. The ability to be able to share content in real time between those two physical spaces is really powerful." Futuresource's McIntyre-Brown expects to see a huge pickup for collaboration boards in higher ed. "There's a very clear usage driver," he said, pointing to several vendors that have launched or announced big displays that allow people to connect wirelessly to the screen, share content and collaborate nearby or far away, including Microsoft with Surface Hub, Sharp with Aquos Board and newer entrants Cisco with Spark Board and Google with Jamboard. While interactive whiteboards haven't gained much of a following in higher ed in the past, that could change. This new generation of collaboration boards addresses a big limitation the earlier one lacked: The instructor doesn't have to be tethered to the board to work on it; he or she can move among the students. Because the rollout of flex classrooms at Salt Lake CC is taking place over three years, the college can upgrade its projectors to address "shortcomings" along the way, according to Shirkey. The latest model of BrightLink being installed: the 697Ui, a wireless ultra-short-throw interactive device. "We were always pushing for a higher resolution and brighter images," he said. "Fortunately, in this latest model, they're brighter — 4,400 lumens — and they also have WUXGA native resolution that's high enough to really meet our demands for HDMI inputs." Find the latest in projectors, displays, video walls, audio products and more here. As Shirkey sees it, the advantage in going with interactive projectors over, say, LCDs is that the projectors can generate much bigger images. "It'll project an image up to 100 inches on the diagonal," he noted. Second, "You have the ability to interact with the display. It becomes more active. You can use the annotation pens that come with the projector, or your finger with the finger touch module, and go up and start annotating all over your displayed material." Third, the projector comes with software that offers whiteboard screens for different subjects. "If you're a math teacher, you can go up and have the students write out the entire math problem on the wall and save it as a JPG or PDF and e-mail it out to the rest of the class." Test said luminosity has become a big deal at Penn State. "High lumen output used to be something that was a nice to have, and it's turned into a necessity, especially in rooms where we can't control the lighting," he explained. "We want to give people the flexibility to move around furniture and rearrange things. We can't assume that they're going to be sitting with nicely dimmed lights to see the projection screen." To address that uncertainty, the university has adopted a bare-minimum standard of 6,500 lumens, but prefers projectors that are 7,500 and 8,000 lumens. "That enables us to have a nice, bright image even in a room where all the lights are on. People can do group work or other things, but they can still reference the screen without having to dim the lights." One tricky aspect of collaboration is audio. As Salt Lake CC's Shirkey pointed out, when you have groups all doing a project and shuffling their displays among various screens in the room, there's no problem. "But you can't have five different audio tracks playing at the same time. You have to make decisions about how you're going to limit audio for each of the groups." Otherwise, the class will become a cacophony of sound. To address the problem, the flex classrooms use a single set of speakers, embedded in the ceilings and controlled by an Extron switcher. A touch panel that enables instructors to control all the technology from a single location also lets them specify who the "primary audio" is. "You can mix and match as you want," Shirkey said. Tomei's concern for the schools where he consults is making sure the audio is heard from throughout the classroom, especially by those who are attending remotely. "A lot of what I do is explain why I'm putting in multiple microphones connected to a digital sound processor that's going to handle all of the acoustic, echo cancellation and audio mixing of those microphones, so everybody in the room can be easily heard on the far end," he explained. "That's sometimes a little bit of a shock to clients. They just think, 'Well, we can throw a webcam in there and we're good to go.'" Luckily, he added, a lot of companies are coming out with USB microphones and cameras that are on a "more professional level than those little webcams you're going to buy at Staples." While those are useful for "huddle spaces or small classrooms," in larger rooms he'll recommend a "pretty conventional microphone design" that uses multiple ceiling microphones to pick up students' voices or table microphones if there are fixed tables in the room. Plus, he'll also suggest wireless mics such as the kind seen in lecture halls. Whatever those choices are, the piece that "ties it all together" is the use of digital sound processors, which handle echo cancellation and audio mixing to deliver high-quality audio. Also, Tomei will turn to devices such as Vaddio's EasyUSB AudioBRIDGE, which convert HDMI video and analog audio to a USB connection for web conferencing. Currently, a "lot of companies" are getting into that market, making sure that their devices are recognized by all the major web conferencing software packages. "Really, to Zoom, it's just another webcam and microphone that's being connected. But to us it's high-quality audio and video being converted." Those immersed in AV in higher ed walk a fine line in attempting to figure out whether the introduction of new types of technology will boost student learning in the classroom or present a learning curve so steep that it's going to take away from the faculty's time. "Balancing that is something that we take seriously," said Test. To avoid heading over the abyss, Penn State tests its products and services by setting them up for amenable faculty willing to run a pilot. That practice has come from hard experience, he admitted. "When we put in interactive boards, we found that people didn't use them. They already had a whiteboard or chalkboard and they already had a presentation surface. Keeping them at the front of the room and reinforcing that lecture dynamic wasn't really helpful to them," Test recalled. "When we transitioned to the tools that helped them democratize the room a bit and have them be a partner in the learning process with the students, then we've had a much better embracing of that, and the students seem to respond positively to it as well." Who can ignore the affinity "mega-campuses" have for huge video walls? These definitely have an ego edge to them, said Chris McIntyre-Brown, associate director of professional equipment at Futuresource Consulting. "Not all of it is relevant, depending on what kind of communication you want to have with your students." However, he wouldn't say the same for digital signage in general, particularly along concourses and in reception areas. "That's a relatively buoyant vertical for LCD displays," he noted. Classrooms want to add as many writing surfaces as possible. Utah's Salt Lake Community College tested out glass walls in its flex classrooms as a way to break up the "white stripe" posed by having too many whiteboards in the room. One discovery early on: Glass walls don't play well in rooms with dark walls. "If you're writing with a black marker, you can barely see it," said Kurt Shirkey, assistant director of classroom tech support. Managed switches are going into AV racks. AV design consultant Mike Tomei encourages this practice, along with adding monitoring and control software such as Crestron Fusion Cloud or Extron Globalviewer Enterprise. That enables each department to connect and manage its devices through services provided by IT. "We connect all of our AV equipment to those switches and work with the IT department to set up specific VLANs or subnets on their network just for our AV devices [and] video conferencing devices we're connecting," Tomei said.